Elizabeth’s Casablanca Bridal gown was exactly what she wanted. With satin fabric, gold-colored threading, and embroideries on both the front and back of the bodice as well as the train, this gown was the icing on the cake for her big day. When we received the gown, it had make-up and perspiration inside the bodice and on the underarms. There was evidence of a spill on the front of the skirt and there was a dirty hemline. One of the bustles was missing a loop. 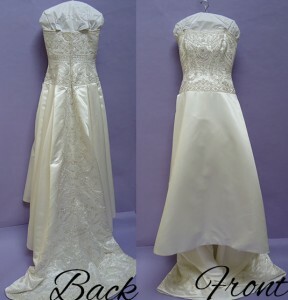 We wanted to give this dress the royal treatment, so we started by hand cleaning the gown, using the wet process. 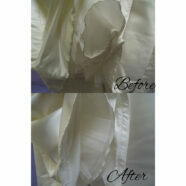 We also spot cleaned the veil and then hand-pressed both the gown and veil. We finally used our Museum Method Preservation as a final, important touch to this beautiful gown! Wives can still feel like a bride whenever they view gowns that have been treated with Museum Method wedding dress preservation.